Codesummit is a top 25 Kentico Gold Partner delivering hundreds of Kentico sites and delivering success for our clients. It starts with your business goals. Your success is defined by you - it's up to Codesummit and Kentico to help you meet that success. With our vast Kentico experience and DevOps process, Codesummit builds every site with high standards, fast delivery and long-term commitment. Not just support, but so much more. Our support packages are not just for issues or bugs but are built for your business needs. Looking for new development, support, upgrades or whole new projects? Codesummit can deliver it all. We also support your budget by offering discounts up to 35% off our standard rates. With a fixed cost support package at the lowest rate, delivering all of your web CMS needs - this is what true support really means. If Codesummit built your site and you're on a support package, upgrades are no problem. For sites built by other developers, Codesummit offers the experience of nearly one thousand upgrades and we can upgrade your site. Codesummit can get you from any version to the current version and at some of the lowest costs. Connecting Kentico means exposing your content to meet your businesses strategic goals. This is how we view integrations, as the opportunity have your content work for you. We look to maximize ROI though careful planning and Agile code delivery. Codesummit has experience connecting Kentico to dozens of systems to meet the needs of our clients. Short on resources? We can help. Keeping your content up to date is critical for your business and Codesummit can help. We can help deliver your content to the web. Our Kentico content team are experts in creating content in Kentico, efficiently and effectively. Your site deserves Peak Web Performance™. You chose world-class CMS and development, so why let your site be hosted on something less than the best cloud platform? Our Microsoft Azure hosting is the only choice to meet your business needs. 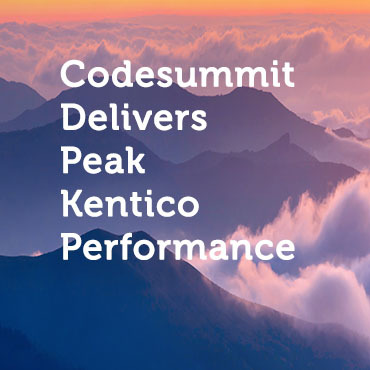 Codesummit employs Kentico best practices combined with our core standards to deliver Peak Kentico Performance. Managing your content in your CMS should be easy. You have chosen one of the Best CMS systems available, but often developers make choices for you that leave your ability to manage content more difficult than it should be. Codesummit employs a combination of Kentico best practices, with years of content delivery and optimizations to create a site that is easy for you to manage and your customers to navigate. Your site should be delivering more. Developers who use multiple CMS systems and don't fully embrace the best of what Kentico delivers, often build sites that have too many customizations or poor structures. This create a site that is hard to maintain. Getting additional functionality or security hotfixes become secondary to trying to keep the site meeting simple content needs. Upgrades are easy for Codesummit sites. Kentico releases new features every year, giving their customers the tools to keep on top of their content strategy. When it comes time to upgrade to the latest version of Kentico, is your developer struggling to upgrade a site they built? Codesummit employs careful planning and testing of every feature we deliver. We also conduct internal testing of new Kentico versions to give you the confidence your upgrade will go smoothly. Code is less custom when it is everywhere. When the situation calls for customizations, Codesummit develops for reuse. This means that we look for opportunities to utilize the customization across your sites, multiple clients and throughout our infrastructure. This helps lessen the burden of maintenance and improvement so you can invest your resources elsewhere. Your CMS should be about delivering content. Tuning Kentico to deliver your content faster is our goal. Codesummit not only utilizes best practices, but over the past decade we have found the performance modifications which give our Kentico sites an advantage over others. We also have teamed with Microsoft as an Azure Silver Partner, placing our customers' sites on the best cloud platform available. With a scalable cloud delivery platform, fast Content Delivery Network (CDN), high availability, superb security and excellent disaster recovery, your site will deliver Peak Performance like never before.